Why Pinterest? Pinterest is an incredible search engine tool that is perfect for bloggers and marketers to grow their businesses online. The trouble is, most website owners either do not have their Pinterest account set up correctly or are not using Pinterest to gain followers, grown their blog and get free website traffic. Imagine a situation or your life if you could… Grow your online traffic and social media following like you couldn’t imagine in just an hour a week. Constantly draw in new clients and customers (not to mention traffic) who are excited to hear what you have to say and are more than willing to share it with their friends and followers. A blogger’s dream, right?! Become the online leader in your area of expertise. Be the go-to person for in-the-know. Have a social media following that you can rely on to engage with you. To buy your products, services, etc. Have business growth without spending money on ads. Have orders come in and be able to pinpoint exactly where the traffic is coming from. Have extra hours in your day to create amazing content, engage with your audience and spend time enjoying life away from your blog, knowing it will continue growing even while you aren’t working (maybe even sleeping!). Practically everything you do will become automated, and you can sit back, smile and go do other fun things. 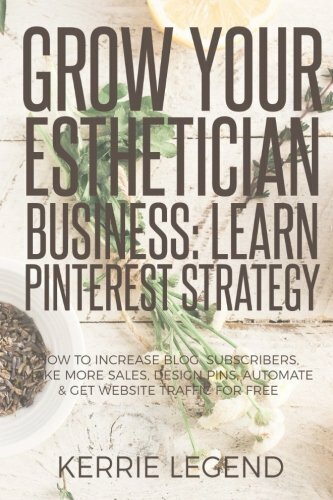 Kerrie Legend developed a course on Pinterest and is sharing her expertise on this amazing online resource so bloggers and marketers like you can benefit and grow. Learn how to design pins, automate using 3rd party services like Tailwind and BoardBooster, and use pins and boards strategically to get viral attention for your website.